Loud As Hell, the incomparable Badlands metal fest has just released their lineup for the 2019 rendition and it’s an absolute banger! 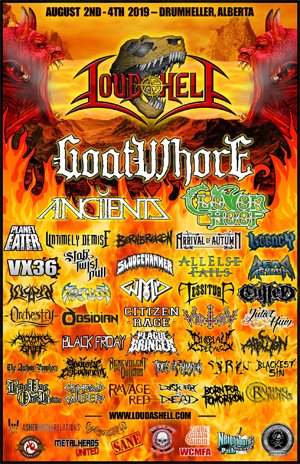 The headliner for this year is New Orleans’ GOATWHORE who will be melting faces with blackened death metal while the sun melts everything else. The 3-day fest will feature 40 bands in total over the course of the weekend in Alberta's scenic Drumheller badlands at the Dinosaur Downs Speedway on August 2 - 4, 2019. "The Loud As Hell Festival in Drumheller, Alberta, Canada is one of the top underground metal festivals in the country... it's a metal family reunion!"